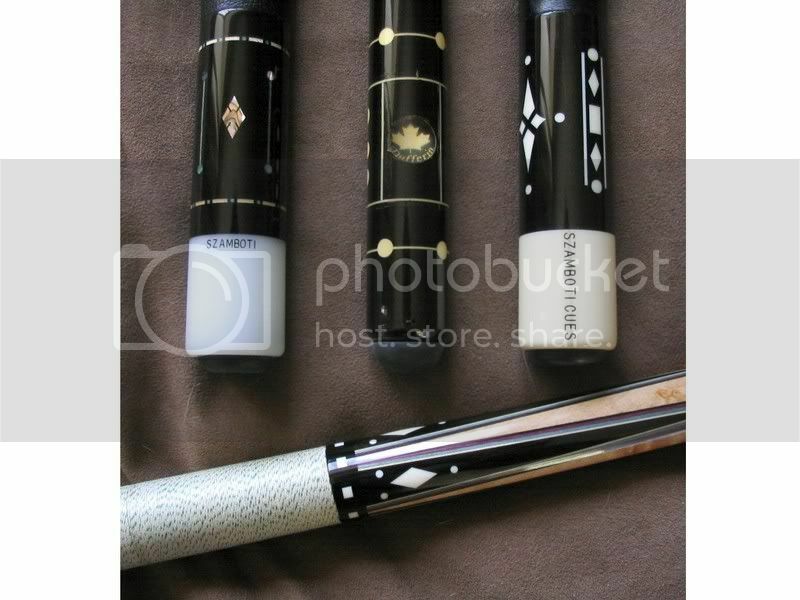 This is a special cue made by those great cue makers, Dufferin, from ebony and genuine ivory substitute. Made in very limited numbers (5000 or so give or take a 1000), this was a sure fire collectable. Notice how the high quality plastic cover over the Dufferin logo blends seamlessly with the ebony and how expertly put on the bumper is....not intrusive at all. Sorry for putting the junker cues around it but I had nothing else in my collection that would highlight just how special this cue is. Very nice but the cues around it are cluttering the picture. Send them to me and I will take care of disposing of them. How they were they able to inlay that maple leaf so expertly and keep all the edges sharp???? The execution is just mind blowing, Paul. Murray...I accept your offer....but only if I can pay for shipping too. Those Szamboti's seem positively portly compared to the Dufferin toothpick. Last edited by icon on Fri Aug 21, 2009 3:37 pm, edited 1 time in total. Last edited by thediamond on Fri Aug 21, 2009 4:01 pm, edited 1 time in total. Last edited by icon on Fri Aug 21, 2009 3:36 pm, edited 1 time in total. Last edited by thediamond on Fri Aug 21, 2009 6:35 pm, edited 2 times in total. Last edited by thediamond on Fri Aug 21, 2009 4:02 pm, edited 1 time in total. Last edited by icon on Fri Aug 21, 2009 3:32 pm, edited 1 time in total.